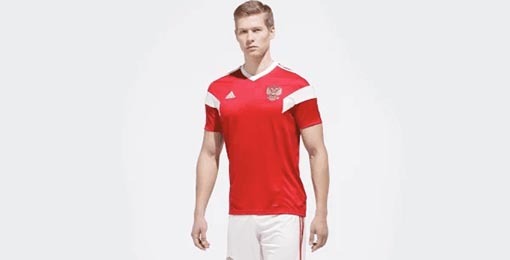 If you want to buy cheap russia shirt for 2018-19 season, buy it here in cheap-football.com , Check our exclusive range of russia Football Shirts / Soccer Jerseys and Kits for adults and children at amazing prices. Get the cheap russia jersey shirts, soccer kits with wholesale price, Free Shipping Worldwide! The first match played by Russia was held during the 1912 Stockholm Olympics. However, this team only played 90 games (between 1912 and 1914). In 1923, they returned to the playing fields but as the football team of the Soviet Union, of which Russia was a part and participated in seven World Championships (reaching the semi-final in 1966) and in seven European Championships, where they won the title in 1960. The Soviet Union also won a title in Chile, the U-20 World Cup in 1977, another in the U-17 of 1987 and two gold medals in the Olympic Games.After the breakup of the Soviet Union in 1991 and the independence of Russia as a sovereign state the Russian team was reborn in 1993. The Russian national team is considered internationally as the successor of the former Soviet team, but the achievements of the past have overwhelmed the new selection, which has tried unsuccessfully to achieve the success of its predecessor, which also had the talent of players from other ex-Soviet countries such as Ukraine.In its new stage as an independent team, Russia has reached the final stage of the World Cup in three occasions and five times.